Canada-based Software-as-a-Service (SaaS) startup Eka Innovations Inc that operates under the Procurify brand has secured $4 million in seed investment from Nexus Venture Partners, Point Nine Capital and the Business Development Bank of Canada, according to a press release. The startup, which offers purchasing software to small- and medium-sized businesses worldwide, will use the funds to fuel its continued growth in the multi-billion dollar cloud and mobile enterprise software market with further investment into sales, marketing and product development. Ryan Holmes and Steve Johnson, CEO and chief revenue officer of Hootsuite, a social media management platform based out of Canada, also joined this round and acted as the advisors to Procurify on the transaction. "We are excited to be working with investors that have such experience backing successful cloud-technology companies. They are providing Procurify with the expertise and knowledge to help grow the company into a world class organization, dedicated to our mission to create solutions that help unlock the potential of every individual," said Aman Mann, co-founder and chief executive officer of Procurify. Procurify, which graduated from Vancouver's GrowLab accelerator program in 2013, is used in over 58 countries worldwide for a variety of industries, including schools, hospitality groups, technology companies, among others. Its clientele includes names like GardaWorld, one of the largest privately owned business solutions and security services companies in the world, and AltSchool, a fast-growing chain of schools with locations throughout San Francisco and aggressive plans to expand nationwide. "Procurify is re-imagining enterprise spend management for the mobile era," said Jishnu Bhattacharjee, managing director at Nexus Venture Partners. 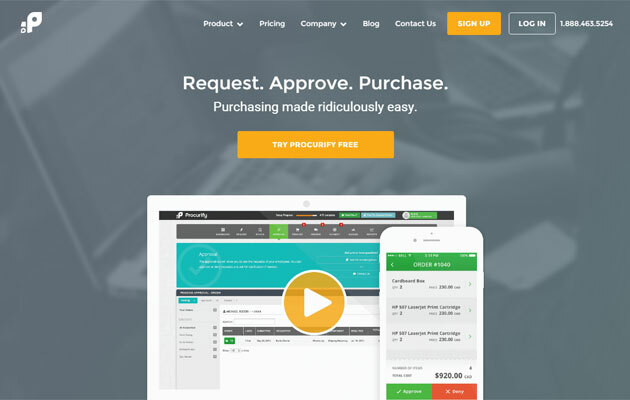 Procurify said that it is expecting to process more than half a billion dollars of purchase orders on its platform this year. India's Nexus Venture with over $1 billion under management and an active portfolio of 60 companies has invested across industries like technology, internet, media, consumer and business service sectors. Although it is an India-focused VC firm, Nexus also invests in North American startups through its Silicon Valley based office. In most cases, these overseas tech ventures it backs have an India footprint either through a software unit or counts an Indian origin co-founder. Procurify is one of the exceptions.